One of the first things you'll have to master when you begin learning to drive is changing gears. Some people will find it relatively easy and straightforward, whilst others may struggle. If you're part of the latter group, then don't worry! We're here to help you successfully master changing gears. When driving, you should be able to change gears without looking down at the lever or your feet. Practise this sitting in the car with the engine switched off and the clutch pressed down. In most vehicles the first 4 gears form an 'H' appearance on the gear lever. 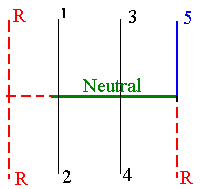 Neutral is the middle position in the 'H' formation on the gear stick. To engage reverse gear you sometimes have to either push the gear lever down or lift it up towards you. Different vehicles have different setups, so always check where reverse is on a new vehicle. Reverse is often in one of the 3 positions marked in dotted red in the diagram. There may also be a 5th gear. 1st Gear is used for moving off, manoeuvring and for creeping slowly in traffic and at junctions. 2nd Gear is used for moving off down very steep hills, building up speed after moving away and driving at low speeds. 3rd Gear is used to build up speed and when you need more power for climbing hills. It also increases your control when going down steep hills and dealing with some bends. 4th Gear is used for driving at speeds generally higher than 30 mph, where there are no hazards to confront. 5th Gear not all vehicles have a 5th gear. This is normally only used on open roads when travelling constantly at higher speeds. To Practise - change UP through the gears on the road, first find a fairly straight, wide road where there is little or no other traffic. Move off in first gear and change into 2nd gear as soon as you can. Accelerate to about 15-20 mph, then change into 3rd gear. Accelerate in 3rd to 25-30 mph and then change into 4th. You will only need to practise using the 5th gear when you are competent using the first 4 gears. To Practise - change DOWN through the gears. When you have built up your speed to 30 mph and you are in 4th gear, check the mirror to make sure it is safe. Brake gently to slow the car down to about 15 mph. Release the brake and change into 2nd gear. Check the mirror, if safe, build up your speed, changing up the gears, until you reach 30 mph again. Keep practising until you feel confident. If you have any questions regarding changing gears, or you'd just like to leave feedback, then feel free to comment and i'll get back to you!